How often are you given the opportunity to sample six different single-malt Scotch paired with five crafty Seafood tastings on a weekday? Better yet… surrounded by friends? Answer: Not enough times. I heard about the tasting via a mere Yelp mention—not even an official Yelp event. 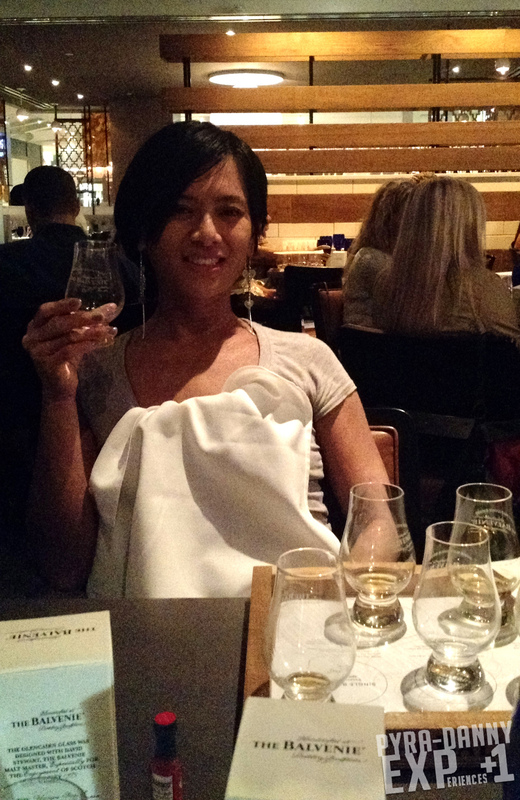 Somehow a group of my friends all snagged places at the limited-seating Balvenie Scotch tasting. 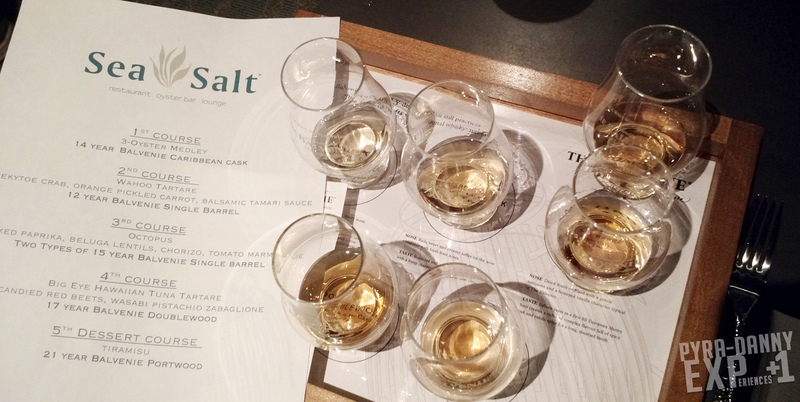 I’m pretty Scotch-clueless but this was to be a Scotch tasting paired with Seafood goodies from SeaSalt—one of the hottest Seafood restaurants in Downtown St. Petersburg, Fl—count me in! Contained too many ingredients for me to remember. We marched through the new SunDial plaza and through the rustic yet hip décor of SeaSalt’s interior. Almost immediately a Scotch-based cocktail was handed to me. I wish I could tell you what was in it… but a rounded Berry sat in its center mixed in with what seemed like a dozen ingredients. David Laird, Balvenie’s Ambassador with a charming Scottish accent!!! (Yes, I know mentioning the accent wasn’t necessary), vocally prepared us for the evening before leading us into SeaSalt’s private room. Every place contained a flight of Scotch presented upon a wooden frame. Although I had tried to read online about Scotch prior to the event- researching was different than doing. As our night proceeded, a few of the Scotch we tasted included Balvenie’s Caribbean Cask, Doublewood, and an unlabeled glass containing Scotch aged for 21 years. Was I becoming inebriated or was the 21-year-old Scotch really that smooth against its siblings? The nibbles provided by SeaSalt began with three raw Oysters. We also tried a Wahoo Tartare topped with Peekytoe Crab and even an incredibly soft Octopus—all presented beautifully in its simplicity. Through Laird’s suggestions, we added drops of Scotch to the dishes which allowed some of the subtler flavors to open up. Or we’d rub Scotch on our wrists to breathe in wood scents. 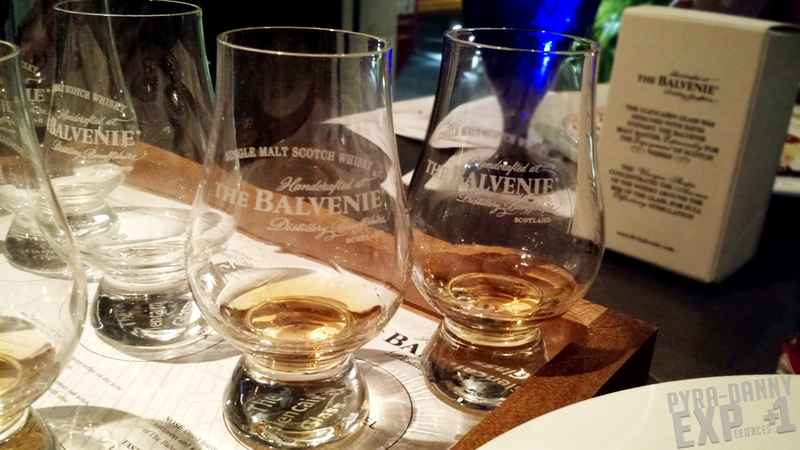 In between stimulating our taste buds, we learned how Balvenie was one of the few distilleries to still prepare Scotch the traditional way. Laird added when he returns to Scotland, his other duties include working inside Balvenie’s warehouse helping to overturn the wet malt on the floor. Am I a Scotch expert now? Definitely not. But I’m now less inclined to pass it over in favor of other drinks. This was a great event and I’m glad Yelp announced it. I just wish the event was shorter… we spent close to three hours there; Scotch and Seafood bites just made me crave more food. Check out another view of the event from my friend Dena Loves. I apologize for the picture qualities here. I forgot my typical mirrorless Sony and had to rely on my phone’s camera instead. Previous Post ARE YOU ECZE-MAD?